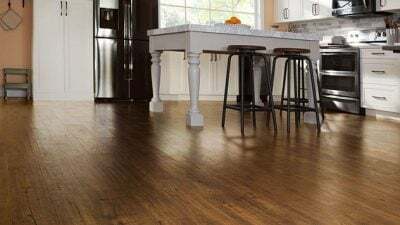 Installing laminate floors is a great DIY project. Glad to hear the Pergo is working out for you. It’s met our needs, but we know it doesn’t work for everybody. Again, it’s worked for some folks, but not others. It’s also good to visit the home center, as there are always new products on the market, and ask sales associates what’s working for customers these days. A perfectly fine product, or tip, could work well for one homeowner but not another. It all depends on various factors specific to each home. That’s why this is a tricky question. What type of tape/pad can I use under our large area rug to prevent it from slipping. There are conflicting opinions when I searched. By the way, we absolutely love our Pergo Outlast + Applewood. It looks more like wood. We don’t sell construction products on this website, but we encourage checking your local home center for these materials. I really like the Smoked hickory. Is this waterproof? also what is the cost per sq ft. I need 700 sq ft and is the underlayment already on it? I used a steam mop on my flooring. And now there is no shine now and it looks like there are scatches Is there anyway I can restore the shine ? Hi – I have a double wide and would like to install laminate flooring but am concerned about where the two sides of the home come together. Is there anything in particular that I should do or watch for when installing in a double wide? I have concrete floor with linoleum on top of it. I’m thinking about some type of wood flooring. Do I have to take up the linoleum before putting the wood flooring down?This is in the kitchen area. Thanks! I have concrete floor with linoleum on top of it. I’m thinking about some type of wood flooring. Do I have to take up the linoleum before putting the wood flooring? This is in the kitchen area. Thanks!